There are many ways to "arrangiarsi" or "get by" in this part of the world. In the film Cafè Express (1980, dir. 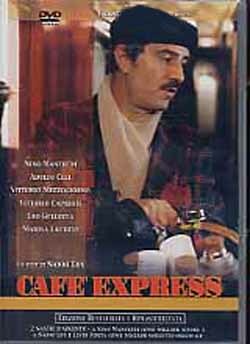 Nanni Loy) with Nino Manfredi, the main character wanders the corridors of an express train selling coffee illegally. He prepares the coffee at home, puts on his homemade uniform, gets on the train and goes to work, always staying a step ahead of the conductor. Much Neapolitan humor deals with this figure of the 'survivor,' the one who will do anything to make a living. Wait. Not anything. The true Neapolitan survivor will not steal. That is undignified and carries no honor or sense of achievement with it. The real 'survivor' offers a service or a product. Those who offer, perhaps a bit forcefully at times, to wash the windshield of your car while you're stopped in traffic are an example, as are the vendors of paper handkerchiefs and cigarettes. They are at the bottom of the list in terms of creativity, however. A better example would be Massimo Colatosti, who may have been be the only person in the world to wish for monster traffic jams every morning when he awakened, and who had a very good job until cell phones became so common. Massimo wandered from car to car offering cell phone service to those who were stuck in traffic and who needed to make a call. Apparently, he was a gentleman and didn't charge if the caller was ill and had to make an emergency call. On the other hand, if it was just young lovers who wanted to whisper sweet nothings, Massimo charged them sweet somethings. He charged men more than he charged women. The true survivor is nothing if not chivalrous. There is another kind of job that is necessary —but shouldn't be. It's not a street corner job, either. There are respectable little offices called "agencies". The sign in the window tells you they take care of driving licenses, birth certificates, residence papers, this document, that paper, etc. If, for example, you need a document to attest to the fact that you have no criminal record, you can go in there, pay some money and come back a few days later to find your papers all in order and waiting for you. But, you say, couldn't you do that yourself just by going to the appropriate office at the City Hall? Yes —if you want to stand in line. If you wander into the city hall or police station or hall of records looking for just the right wayward scrap of paper with your name on it —well, you can kiss the whole day good-bye. The bureaucracy in Naples is Byzantine; indeed, the Greeks invented Catch-22 (You can't do A before you do B; but in order to do B, you have to show that you have done A). Pythagoras, himself, is said to have been trying to prove that there was a number between 21 and 23. Maybe the Neapolitan version has to do with the still proud attachment that Naples has to its Greek roots and traditions, or maybe it's just that everyone needs a job. This is one more way to "get by". You are essentially paying an outrageous amount of money to "queue standers". That's all they do. They put in the time so you don't have to. They make a good living, too. I understand that it is even a profession passed on from father to son, just as were the noble trades of yesteryear: the silversmith, the carpenter, the luthier—and, now, the guy who waits in line. "Yes, my boy," says Father (sweeping his arm out in a grand gesture to show his son the 432 people in front of them in the queue), "some day, all this will be yours."